A portion of a pump, at the temporary station located at the 17th Street Canal, was removed for rust-related repairs in 2010. Crews clear out the canal in front of the 17th Street Permanent Canal Closure and Pump Station in May 2017. 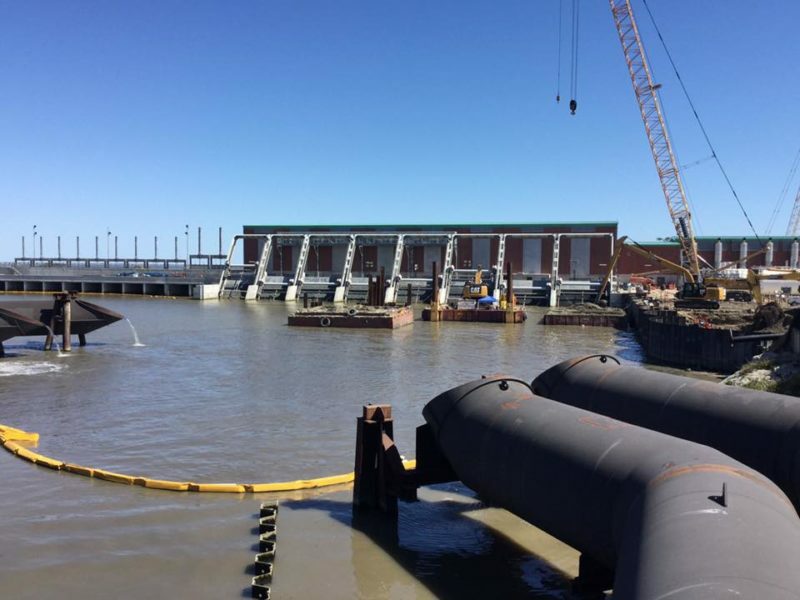 Next month, the agency that oversees the hurricane protection system around metro New Orleans is expected to take over new pumping stations at the mouths of the three canals that carry stormwater into Lake Pontchartrain. The transfer will mark the end of a decade-long saga of broken and corroded pumps, construction delays and millions of dollars in repairs that may have been preventable. Since 2006, temporary pumping stations protecting Orleans, Jefferson and St. Bernard parishes against hurricane-related flooding have experienced serious failures due to problems including rust. Pumps have been removed for repairs during hurricane season, sometimes for months, causing critics to venture that communities weren’t properly protected. But it would’ve taken more time to get better pumps, and the corps was racing against the clock to get the temporary pumps installed for the 2006 hurricane season. By McBride’s count, between 2006 and 2017 the corps removed pumps about 50 times from the canals in New Orleans to repair or replace them. By 2012, he concluded that the corrosion problem was a “fiasco six years in the making,” noting some pumps had been pulled for repairs three times. Now all the pumps at the mouths of the outfall canals in New Orleans use stainless steel, corps spokesman Ricky Boyett said. That came just in time for the corrosion-resistant replacements to be irrelevant, as the temporary pumping stations will be shut down and disassembled when the permanent ones start up. The permanent stations, which employ bigger, sturdier pumps, will be operated by the Southeast Louisiana Flood Protection Authority-East. That agency is in charge of the rest of the complex network of levees, floodwalls, floodgates and other structures protecting the metro area. The story, like many, begins with Hurricane Katrina. Back then, stormwater flowed freely into Lake Pontchartrain from the city’s three primary drainage canals, located at Orleans Avenue in Mid-City, London Avenue in Gentilly, and 17th Street between Lakeview and Metairie. As the hurricane passed by the city, the lake rose and water backed up in the canals. Floodwalls along the canals buckled, a major cause of the flooding that inundated about 80 percent of the city. Under pressure to get something in place before another hurricane could flood the city, the corps decided to build temporary stations. The temporary pumps, built of carbon steel, had to be rebuilt or partially replaced due to rust and other problems. After the storm, the U.S. Army Corps of Engineers was charged with fortifying the levees around the metro area and building floodgates at the mouths of the canals to prevent storm surge from overwhelming them again. Now, when a tropical storm approaches, the floodgates are closed. Enormous pumps push water past the gates into the lake, preventing water in the canals from rising to unsafe levels. The pumping stations that have guarded the city since 2006, though, were a short-term fix. Under pressure to get something in place before another hurricane could flood the city, the corps decided to build temporary stations designed to last between five and seven years. In the meantime, it started work on the permanent stations. The corps announced it expected to finish that work by 2013, but the contract wasn’t even awarded until that year. The corps is now set to hand over the permanent pumping stations, which cost $693 million, to the regional flood protection authority in April. In the meantime, the temporary pumps, built of carbon steel, had to be rebuilt or partially replaced due to rust and other problems. Over the years, he said, the temporary pumping stations were battle-tested by seven weather events, including five named storms. He never answered The Lens’ questions about how much the repairs cost. According to McBride, the cost of corrosion-related repairs in New Orleans was at least $8.5 million. But that doesn’t include every pump that was repaired. Derek Boese, a top official with the Southeast Louisiana Flood Protection Authority-East, said corrosion-related repairs in St. Bernard cost about $650,000. The authority is talking to the corps about getting reimbursed, he said. The temporary pumps were built with carbon steel, which proved problematic when placed in the brackish water of southeastern Louisiana. “Since it is submerged, it should not be made of material that will corrode,” Boese said of the pump components. McBride raised questions about corrosion more than a decade ago, well before the pumps should have required repairs. He filed federal Freedom of Information Act requests with the corps and obtained reports, emails, memos, receipts and dated photographs. 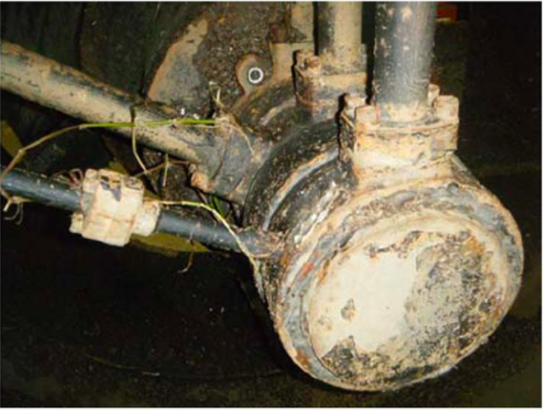 They revealed that the corps had found corrosion as early as June 2006, on hose connections that sat near the waterline. At that point, McBride wrote, the corps had “a hint” that pumps made of carbon steel “would perform quite poorly.” Over time, the corps became aware of more corrosion problems when pumps started leaking oil into the canals. McBride did not respond to requests for comment. After the widespread flooding in New Orleans last summer, he contracted with the city of New Orleans to help deal with problems with a different set of pumps — the ones throughout the city that push rainwater into the outfall canals. They’re operated by the Sewerage and Water Board of New Orleans. In a 2010 blog post, McBride criticized the company that had built the outfall canal pumps — Moving Water Industries Corp., based in Florida — after its employees claimed they had not been informed that their equipment would sit in brackish water. McBride pointed out that its employees were in New Orleans right after the storm and would have seen how the floodwater had killed everything it touched. Critics said political connections played a role in awarding the $32 million contract to that company, which once employed former President George Bush’s brother, Jeb Bush. The U.S. Government Accountability Office investigated the corps’ decision to buy those pumps and concluded that although its decisions favored the company, the corps had valid reasons for those decisions. Despite problems discovered during testing, the corps decided to install the pumps because it believed they would provide some immediate protection, even if they couldn’t handle a severe storm. Details of the pumps’ poor performance can be found in reports by whistleblower Maria Garzino, a former engineer for the corps. Citing her work, the U.S. Office of Special Counsel told President Barack Obama in 2009 that grave issues remained with the pumps, including their tendency to corrode. From 2006 to 2008, McBride accused the corps of “missing the big picture” of corrosion throughout the pumping system. McBride contended on his blog that the corps should have dealt with the problem immediately by replacing all carbon-steel components with stainless steel. He believed the initial expense would have been more than offset by savings down the road. Instead, the corps fixed the pumps in a piecemeal fashion, installing more carbon-steel parts and applying rust-resistant paint and protective metal coating. In the meantime, McBride wrote, the corps ignored “critical moving parts” such as bearings and hydraulic motors. “Effectively, the corps is driving their car with the engine light on,” he wrote at one point. Throughout, McBride wrote about the corps’ reluctance to provide information. One of those pumps was out during the height of last year’s hurricane system, diminishing the capacity of a pumping station in Bayou Villere to 67 percent. When asked about whether the corps made a mistake procuring pumps made with carbon steel, Bosworth laughed. A regional approach was taken for flood protection after Hurricane Katrina, but not for funding. A new law could be the first step in setting up a tax to fund hurricane protection throughout Orleans, Jefferson and St. Bernard parishes.